The other day a keen runner friend of mine explained excitedly how her times had improved dramatically after she began listening to a specially compiled 'Running Trax' album. It got me thinking. Could a specially created 'Cooking Tunes' album provide more rise in my bread? More flavour to my Florentines? More skill to my piping? I'm not the first to have thought this. Way back when, Jamie Oliver put together a selection of his favourite Brit Pop songs in "Cookin'" and more recently the imaginatively titled 'Cook Songs' has been released. 'Now That's What I Call....Sizzling'. (The title is a work in progress). What music do you cook to? Do you vigorously whisk to Wham? Gently stir to Sinatra? Crack your eggs in time to Coldplay? I baked this to Radio 4's 'Just a Minute'. Which meant a lot of giggling and guffawing. 7. Allow to cool completely in the tin. Meanwhile, melt the chocolate in a small bowl suspended over a pan of gently simmering water or in short bursts in a microwave. Once completely melted, stir in the yogurt and vanilla and pour the topping over the cooled oaty base. What music to you bake to? I am entering this into this months Tea Time Treat bogging challenge, alternatively hosted by myself and Karen from Lavender and Lovage. 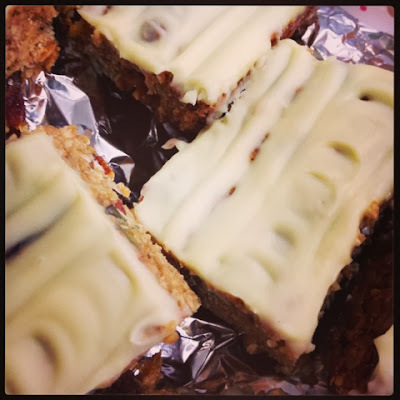 September is Karen's month and the lovely theme is Flapjacks, Oats and Traybakes. I love your selection of music! I had to chuckle at some of the songs. I like the sound of my whirring brain when I bake so I usually don't have music going. These muesli bars look wonderful, and with a yoghurt topping..yummy! i love the section of songs we'll hopefully never have to listen to! inspired! sometimes i like to bake in silence, especially if i've had a chaotic week and need some quiet. otherwise, i usually have our national Classic FM radion stattion playing. i like calming music. I heard it through the grapevine? What about Brown Sugar, or Magic Moments or something from Hot Chocolate! Some great music. What about Sugar Sugar, Honey Honey or American Pie? Love the yoghurt topping on the bars. Love your traybakes and great music choices. When I have a fruit glut, I'm very partial to Jammin in the kitchen to Bob Marley! Love the sound of a yoghurt topping on muesli bars!